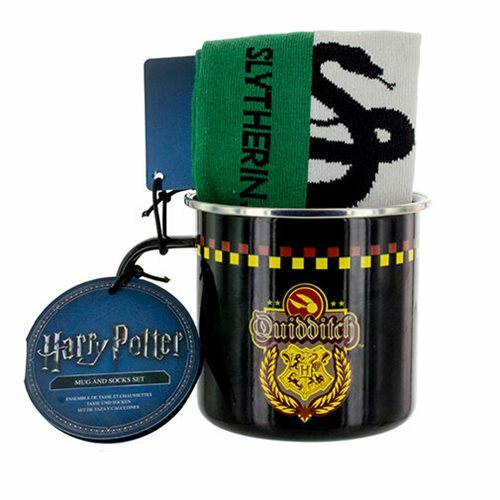 Cheer on Crabbe, Goyle, and Malfoy during the Quidditch Cup and show your support with this Harry Potter Slytherin Quidditch Tin Mug and Sock Gift Set. This gift set contains a mug and a pair of UK men's size 7 - 11 socks. It is the perfect gift for lovers of Quidditch and the Harry Potter stories in general. The socks are in the Slytherin colours of green and silver and feature the house's name and a black serpent design. The black tin mug features the Hogwarts crest and the word "Quidditch" on its side. Hand wash only. Not dishwasher safe. Do not microwave.